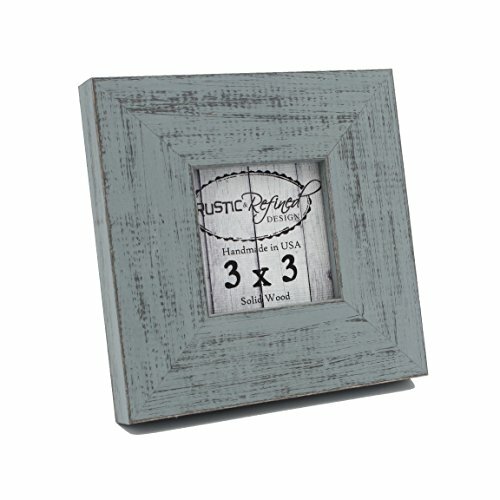 This cute little "Country" square picture frame with a 1.5" width border is perfect for displaying your small pictures, artwork, special notes or instagrams. Also a great wedding or baby shower favors or decorations. It comes in a variety of other colors. made out of solid wood and comes with dowel for table displaying. Frame can also be hung on wall using the dowel hole in back or the included sawtooth hanger. The depth of the frame is 3/4 inch. These solid and sturdy frames are held together with 2 15mm v-nail fasteners and wood glue in each corner. If you have any questions about this product by Rustic and Refined Design, contact us by completing and submitting the form below. If you are looking for a specif part number, please include it with your message.